Silver Dolphin Books, 9781684123216, 30pp. Write, erase, and complete the mazes all over again! 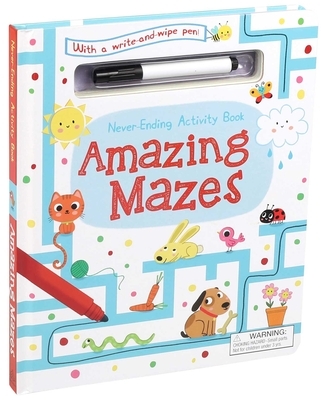 From outer space to under the sea, Never-Ending Activities: Amazing Mazes features 15 colorful and fun mazes in a wipe-clean format. Guide a polar bear to her den, lead a digger to a pile of dirt, and more in each uniquely-themed maze. After completing each maze, youngsters can simply erase their wipe-clean marker and do the mazes over and over and over again! Sonia Baretti is an Italian illustrator specializing in illustration for children. She lives in northern Italy in a small town near Bergamo. She always loved to draw, and this led her to attend a school in Florence where she studied illustration. Sonia has worked on a vast array of illustration projects: children’s picture books, flap books, educational books, game books, toys, stickers, and covers. She loves working on all sorts of different projects—her favorite things are drawing animals and using lots of color!